What Do You Want to Know About the 2019 Porsche 911 GTS? I’m in sunny, beautiful, not-at-all plastic Los Angeles to visit one Andrew Collins, our beloved reviews editor who is sunny and beautiful and currently on leave with a smashed-up hand (hand review forthcoming). To guide us around, we’ve snagged ourselves a 2019 Porsche 911 GTS, and it is already absurd. Absurdly good. I’m writing this from Andrew’s apartment at the moment, and it’s with that sort of close proximity to Mr. Collins’ kind, sweet soul that I can say he is utterly, incomprehensibly wrong. I mean that both in the everyday sense, but also in the sense that the 2019 Porsche 911 GTS is wild and fun and hilarious. He wrote that the Porsche 911 GTS was “missing fun,” and for that, I wonder what else that wonderful, splendid Andrew is missing. Because it’s not only fun, it’s a riot. It’s loud and growly and barky and low and sleek and while yes, this is a stereotype of Porsches, its steering is the damn near the best of any car on the road today. 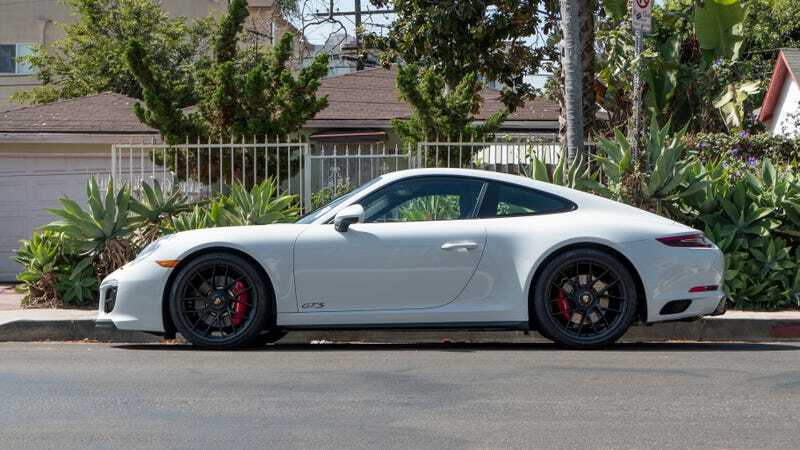 And if you’re not familiar with how it fits into the vast Porsche 911 lineup, the GTS is one step above the Carrera S, and one step below the Turbo. The Carerra S is one step above the base model Carrera. The Turbo is one step below the Turbo S, which is in itself roughly on the same level as the GT3 depending on whether or not you’re going to occasionally hit a bump and whether or not you really love blasting as fast as possible around a track, and that’s all a step below the GT3RS, which in turn is a level under the uber-insane Porsche 911 GT2RS. Ish. Sort of. And then there’s the Carrera T and the GT3 Touring. I know, I know. This is a good thing, don’t worry. And this one is a coupe. Meaning the roof stays in one place. Unlike the convertible. Or the Targa. And only the rear wheels drive this one. Sometimes you can get all-wheel-drive as an option. Yes, it’s complicated, but if you want unique cars you have to learn things sometimes. Learning and cars are fun. The steering is weighted without being disconnected. Too many manufacturers nowadays think that “heavy steering” equals “good steering,” but they couldn’t be more wrong. The Porsche requires a bit more heft than a Camry, but you feel incredible amounts from the road. Also the steering wheel is small. The smaller the wheel, the bigger my heart. The noise, oh the glorious, glorious noise. It’s a shouty rasp that makes people turn heads, but not in the “I AM A BIG V8 MUSCLE CAR MAN” way. It’s fast. I mean that. If you’re not careful it can be a sledgehammer to the back of the head. It’s zero to 60 mph in 3.5 seconds fast. I really have to nitpick, as it is an extremely good car, but it is an eye-watering $130,000. That’s a lot. Porsche Lane Change Assist, which helps with blindspots and whatnot, is an option, and cars costing $100,000 less have that sort of thing as standard. Might as well kick it in, yeah? The brakes are a bit grabby at low speeds and the dual-clutch gearbox constantly wants to go-go-go. It wants to drive fast, which isn’t always the smoothest to manage in stop-and-go traffic. Uhhhhhh....... I don’t know guys, it’s good.